New images are giving us a look at the new UI for the upcoming Samsung Galaxy Watch Active, Samsungs next-generation smartwatch. The new Galaxy Watch Active will ditch the much-loved navigation ring around the display and instead switch to an interface similar to the new Samsung One UI that is being rolled out on their smartphones. The leaked images show off new watch faces which can be as simple as displaying the current time, or as complicated as showing your workout data and allowing you to jump into your workout app quickly. The Galaxy Watch Active will feature a 1.1 inch AMOLED display, is water resistant up to 50 meters, and has improved heart rate monitoring. 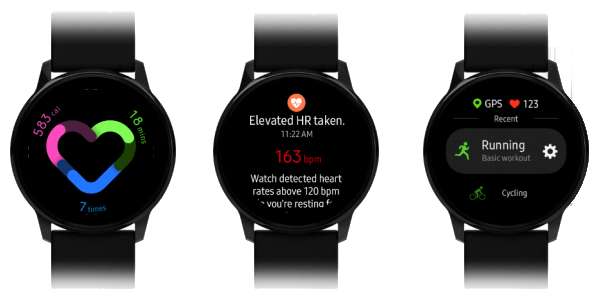 The new heart rate monitor can even alert the user if their heart rate is abnormally high for over 10 minutes. We can expect this new watch to be shown off at Samsungs upcoming Unpacked event happening on February 20th.